Where do you dance? Do you go clubbing with friends? Are you an entertainer or a ballet artist? Do you dance in an exercise class, or in a Broadway show? As a passion or a profession, dancing can take a real toll. Hot spots and dance blisters from shoes, raw skin and chafing from clothes can all keep you from giving your all on the dancefloor. 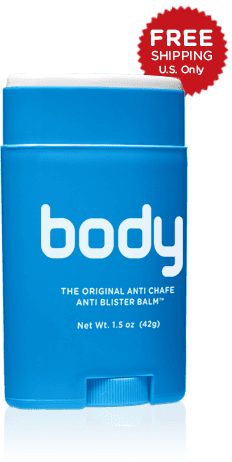 Thankfully, Body Glide’s entire line of anti-chafing balms offer you clean and invisible prevention from irritation, and blisters to keep your body and feet moving to the music. Don’t get caught on the dance floor without it! Protect your feet and toes with Foot Glide. Specially formulated for your feet, Foot Glide prevents dance blisters and all forms of irritation and chafing from cutting it up on the dance floor. Avoid chafing in sensitive areas like inner thighs and armpits with Body Glide Body or Skin. Both formulated to stop chafing, rash, raw skin and irritation caused from skin on skin rubbing or between clothes. Going to an outdoor concert or festival? Use Body Glide Sun, with 30+ SPF, for all your chafing and blister prone areas. It’s also water resistant so don’t worry about breaking a sweat out there during this festival season. Just one application of Body Glide is enough to prevent chafing all day or night. Our products are made with 100% natural plant based waxes so they are never oily and will never stain your shoes or clothes. And thanks to our no-mess applicator all of our products stay where you put them, without wearing off. No matter where, how, or why you dance Body Glide’s entire line of anti-chafing balms protect you and your feet.